The llamas are perhaps the most beloved mammals of the Andes; The llamas live in the mountain regions of Chile, Argentina, Bolivia and Peru, where they contributed greatly in the development of the vast Inca Empire. Nowadays they captivate the curiosity of the people who visit the Inca City of Machu Picchu. By having a close encounter with them, you will realize that these animals can express a range of emotions that can be perceived in their gestures and in their huge eyes. The low oxygen of the places at great heights, makes the breathing of most animals very difficult, but the llamas can live comfortably at these altitudes, in fact they are the inhabitants par excellence of the Andes, and this is because their Blood has a large amount of hemoglobin, allowing them to absorb the scarce oxygen of this environment. The llamas are independent, peaceful and friendly animals. They are very sociable animals, who need the company of others of their kind. They will allow you to approach and observe them, but do not invade your space. Do I have to be careful with the llamas? Yes, llamas that feel threatened, are disturbed, or if they want to free themselves from unwanted attention, expectorate a powerful spit; In rare cases these are aimed at people, but it happens, so we recommend you keep your distance (if you do not know the llama). What is the best time to see the llamas of Machu Picchu? If you have the opportunity to enter the Inca City of Machu Picchu very early, you can enjoy the company of these beautiful animals as much as possible. 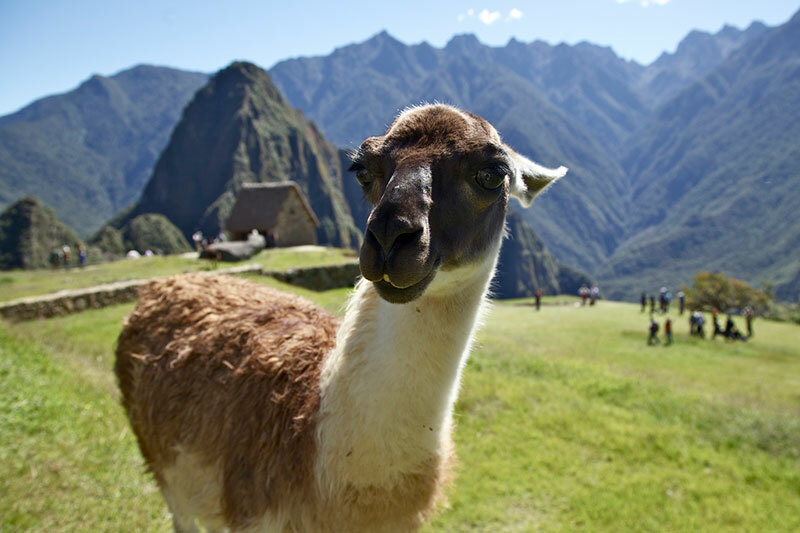 Its 2-toed feet with leather soles, allow you to navigate the rocky roads of Machu Picchu with ease, agility and avoiding erosion; This is why some “environmentally conscious” trekking companies often use llamas as pack animals. Since their legs cause less impact, for the native environment. Many of the llamas of Machu Picchu are accustomed to visitors and seem to pose for cameras that want to capture an image of them. Have your camera on hand, you never know when a llama will poses for you. When the Spaniards arrived in America, they were convinced that the Incas must have been one of the 12 lost tribes of Israel, and that the llamas migrated there after disembarking from Noah’s ark. The Jesuit José Acosta in his book “The Natural and Moral History of the Indias” raises the following question: How can there be animals in the Indias that are nowhere else in the world? Jose acosta also says of the llamas: “it is the animal of greater profits and smaller expenses of those who are known” he believed that God united sheep and donkeys in the same species. The Incas explained the origin of the llamas as did most of the ancient populations of America, through a legend: It is said that the son of Manco Capac and Mama Ocllo (mythical founders of the empire of the Incas), fell in love with one of his Younger sisters who was destined for the sun god. The Inca emperor flatly refused to give his blessing, this caused the lovers to flee, causing their father to condemn them to death. The mother of the lovers implored the pardon of the god Viracocha, who took pity on her and instead of killing them, turned the brothers into animals that wandered with a human look in their eyes. When Manco Capac learned of the animals with human eyes, he ordered them captured and killed. It is said that the spirits crossed the Milky Way to the abode of Viracocha. It is said that upon reaching their destination, these spirits will regain their human form and return to a new kingdom with harmony among men. The llama is a domestic artiodactyl mammal of the family Camelidae; Has long, thick hair that keeps it warm during the cold days in the mountains. The predominant colors in the llamas are white and brown, but they can be of various colors and combinations, each llama has its own style. It abounds in the altiplano of the Andes of Peru, Bolivia, Ecuador, Argentina and Chile.